We are pleased to announce that Kayla from the United States has won the Eurovision card signed by Yulia and Lena in our giveaway. Congratulations, Kayla! And thank you to everyone who entered! Click here to view the submissions in alphabetical order. Vkontakte.ru has uploaded the OK! magazine photoshoot in high quality. Click here to download the original files. We have formatted the files into JPG and uploaded to our photo gallery. We have opened our page for t.A.T.u.’s 10 year anniversary. Thanks to Lei_Fang for the header. We have uploaded an exclusive HQ video of t.A.T.u.’s interview with MTV Newsblock on May 30th, 2009. Click here to download the video. Note: The video will be uploaded to YouTube in 2 parts. Thanks to Alex.A and Barza (tatu.ru/forum). And what do you think is the reason of the band’s success? Yulia: Obviously, we were at the right time, at the right day in the right place. But many people were saying that we became successful due to the lesbian image, that we’re just for several days; a year or two will pass and they won’t need those kisses. But time passed, kissing had finished, it’s a new phase, and there’s music, cool videos. To celebrate t.A.T.u.’s 10 year anniversary, we are doing an online giveaway for a Eurovision card signed by Yulia and Lena on May 16th, 2009. All submissions will be accepted through May 29th, 2009 to May 31st, 2009. The winner will be selected at random on May 31st, 2009, following an e-mail sent by me. Click here to submit your name and e-mail address. Good luck, everyone! 31 May (Sunday) t.A.T.u. will turn ten! Here you may leave all your messages and congrats that will be forwarded to our birthday girls. Only on this day (Moscow time) everybody who will place an order at shop.taty.ru may ask Lena and Yulia to sign music, magazines and posters for the certain person. To do this, place an order and send an email at info@shop.taty.ru with a name of the person and order number. Please put t.A.T.u. Birthday in a subject line of the e-mail. We have compiled a voting and request list for t.A.T.u.’s new single “Snegopady”. Please re-post this list on other t.A.T.u. fansites and translate it into other languages as necessary. Note: This list will be updated if new links are provided. We have uploaded an exclusive HQ video of t.A.T.u.’s appearance on the TV program “Russian Sensation: Stars Against Glamor” on channel NTV on May 23rd, 2009. Click here to download the video. Thanks to Alex.A and Leska (tatu.ru/forum). Yulia: My father always joked that if I do not study, he will dress me in an orange jumpsuit, and I will build roads! Nfne has uploaded a high definition video of t.A.T.u.’s performance at Eurovision on May 12th, 2009 in Moscow, Russia. Click here to download the video. Note: You can play the video in a standard media player. Thanks to Alex.A. t.A.T.u.’s guitarist Troy Maccubbin has posted new messages on his official Twitter account from May 17th to May 21st, 2009. Lena Katina will be back in Los Angeles in 2 months to continue working on her solo project. Click here to read all of his messages. May 17th: In studio working on Lena tracks! Sounding big!!! No Lena, just us guys. May 18th: Lena will be back maybe in 2 months. We will continue to write & record. May 21st: You are all going to flip out on this new Lena project! Boris Renski’s report about Lena in L.A.
Let me start it from the very beginning, recalling some things you do know, be charitable. So, Lena and Olga Matveeva, who’s position is now a travel-manager and a personal assistant for Lena, arrived by plane to San Francisco late in the evening of April 19. We have uploaded exclusive HQ sets of t.A.T.u. and Yulia Volkova from 2009. Yulia Volkova attended Dima Bilan’s album presentation on May 15th, 2009 in Moscow, Russia. “Snegopady” is number 1 on MTV Russia! t.A.T.u.’s new music video “Snegopady” is number 1 on MTV Russia’s top 10 music videos! t.A.T.u. have succeeded popular Russian artists Maksim and Timati. Our congratulations! Click here to view the top 10 list. Thanks to Anka_PylemeT4ica and Fanta (tatu.ru/forum). Click here to view part 2 and part 3 on YouTube.com. Thanks to House 13 (tatysite.net/forum). Thanks to Ocean Soul (tatu.ru/forum). And now after 10 years, what do you remember most often? Lena: I remember the very beginning. That was perfect time, not much work. We were living with each other. Yul'ka in my place, and I in her place. We were wandering with friends through the city till 4 am and then we would lie to our parents that we were in the studio. We have uploaded exclusive HQs of Yulia Volkova from May 13th, 2009. I have uploaded new icons to our icon archive made by me. Yulia Volkova attended a party at Eurodom on May 13th, 2009 in Moscow, Russia. t.A.T.u. are in the newest issue of OK! magazine (Russian edition). Click to enlarge the photos. t.A.T.u. performed “Not Gonna Get Us” with the Russian Army Choir at Eurovision on May 12th, 2009 in Moscow, Russia. Click here to download the video. Thanks to Lauiii (tatu.ru/forum). t.A.T.u. performed “Ne Ver, Ne Boisya, Ne Prosi” at Eurovision on May 10th, 2009 in Moscow, Russia. Click here to download the video. Thanks to Lauiii (tatu.ru/forum). Exclusive pictures of Lena Katina in Los Angeles, California. 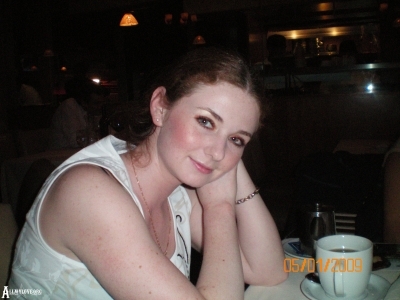 Tatu.ru forum member Diana / nich'ya:) met with Lena Katina and the band on May 2nd, 2009 in Los Angeles, California. Lena revealed that t.A.T.u.’s album “Happy Smiles” will be released in Autumn, 2009. Click here to read Diana’s full report. More pictures will follow. Russia.ru uploaded a new video from the online reality show “t.A.T.u. life”, featuring footage from Lena Katina’s laser eye surgery in April, 2009. Note: select SD (standard definition) or HD (high definition) and the video will play.